We’re going back to basics this week. After the excitement of Eating Eurovision last week and the WOM challenge yesterday, our creative juices have stopped flowing and we’re both in need of something familiar that requires little thought. This is one of the first things I learnt to cook and have been making it fairly regularly ever since, it changes each time depending on what’s at hand when I come to cook it but the basic recipe generally remains the same. This time, I used sage, oregano, thyme and rosemary from the window-box and some sundried tomatoes that I wanted to use up; I didn’t have any red wine so used white instead. It was really good, rich and meaty with a heady top-note from the fresh herbs. The sundried tomatoes didn’t add much in the way of flavour but they freed up some much-needed cupboard space so I’m glad I used them. The meat was particularly good and was tender and melty right from the beginning, I normally cook this down for about four hours but only needed two this time. I got it from the butcher but can’t remember where it comes from unfortunately. We enjoyed the pasta too, a variety we haven’t had before which apparantly translates as “giant snail shell”. Mmm, snails. 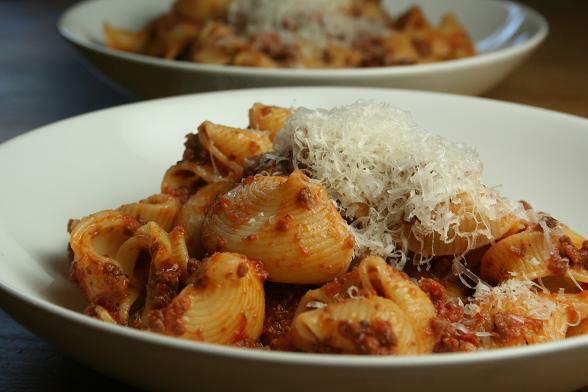 Subscribe to comments with RSS	or TrackBack to 'Lumaconi Bolognaise'. This looks very good! Cupboard space is always in demand! I have taken over a shelf in the hall cupboard as my reserve food store. It is overflowing. I yearn for a pantry! Sometimes the familiar is exactly what we need. Tonight I’m planning to wallow in a comforting lasagne. I like the idea of adding sundried tomatoes though interesting that you didn’t think they added much in flavour.